I don’t care about tennis anymore. Haven’t in some time, actually. But few sports scenarios are more reliably electrifying then the whole “aging American star makes one last run at Flushing Meadows” thing, as they’re battling for their life against some no-name gunslinger — usually a seeded foreign player who looks like he spends afternoons belittling ballboys, hitting on other players’ wives and using the Miami Vice razor to shave his closely cropped stubble. The crowd galvanizes behind our hero from the first point, and the match almost always goes five sets, and the tennis is just breathtaking enough that it makes you wonder, “Hey, why don’t I watch tennis more often?” (until you realize that these scenarios only come along every five or six years). And there’s always a point when they show the clock and the announcer says, “Just past midnight here at Flushing Meadows,” and then it absolutely looks like our hero might lose, at least until the raucous crowd rallies one more time and carries the good guy to victory. And the whole thing is so freaking glorious, it makes you remember why you started following sports in the first place. Well, I love this scenario. 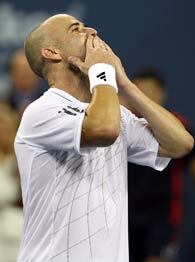 And it’s happened only four times in my lifetime: Connors, McEnroe, Sampras and, now, Agassi. The thing is, I never really liked Agassi. Always thought he was a little contrived. Now I’m pulling for him like a family member. It’s the old Kareem Corollary — if they hang around long enough, no matter who they are, they’re eventually going to sucker you into rooting for them. In Agassi’s case, he kept a low profile over the past few years, said and did all the right things, even married the likable Steffi Graf, and I find myself feeling sad that he’s stepping away, more because this particular scenario probably won’t happen again for some time. Ten years from now, when Roger Federer is playing this role (even as a Swiss player), I’m not going to care. Same for Andy Roddick, the homeless man’s Agassi whose career peaked off the tennis court when he hosted “SNL” and dated Mandy Moore. So this is the end of an era in more ways than one — the last famous American tennis star, the last Connors-like scenario at Flushing Meadows, and in all probability, the last time I’ll probably care about a tennis match. For now? I care. Agassi plays some qualifier named Benjamin Becker this weekend, followed by a potential fourth-round match against Roddick (of all people). And if either of these matches is even remotely like the last two Agassi matches, I’m telling you, adjust your plans accordingly and find a TV set. We’re only eight months into 2006, but this has been the sports highlight of the year so far. At least for me. When I made my plunge into the Premier League last month, people kept telling me to read Franklin Foer’s book and I finally succumbed. It’s well worth the time. It’s like “Freakonomics” and “Blink,” one of those mainstream intellectual books for dummies like us. You learn some stuff, you feel smart after you’re done, and then you can impress people at dinner one night by bringing up anecdotes from the book. This one raised my IQ by about four points … well, for about three days, until a Wednesday night when I watched “Rock Star” and “Laguna Beach” back to back, followed by an all-gay episode of “Next” that ended with a medieval joust. My friend Daniel told me about this and I didn’t believe him, it sounded too far-fetched. But it’s true. For $80 a year, Amazon Prime gives you free two-day shipping on everything you order. And not just that, you can sign up three family members to share your membership with you. Plus, you don’t have to stock your Amazon orders so that everything adds up to more than $25 for the free two-day shipping anymore, and you don’t have to worry about orders backing up around Christmas when you’re shopping for gifts. And they’ll send ANYTHING to you in two days. Doesn’t matter. Could even be a bargain book that costs $4.99. Definitely investigate it if you’re an online shopper — it was my top summer purchase other than a Sony DVD/VCR combo machine that converts tapes to DVDs and allowed me to make a homemade “Larry Sanders” DVD collection. I couldn’t be prouder. Come on, you’re a little jealous. Admit it. MTV pushed this show as “Laguna Beach meets Varsity Blues.” Um, like I wasn’t going to watch that? Star football players juggling multiple girlfriends, overbearing stepfathers and coaches, scrubs puking in 110-degree heat, overcompetitive/buxom/semi-desperate cheerleaders … what’s not to like? Haven’t we been pushing for this show for five years? Instead of a Texas school, they picked Alabama’s Hoover High to follow for the season — seemingly a strange choice until we find out that its stadium seats 20,000 people, and the program has enough money that the head coach can decide before a big game, “everyone’s staying in a hotel tonight, I don’t want any distractions.” And the results are good enough that my buddy Bish took a 10-minute break from work just to discuss the first episode last week. Poor Bish played QB for our tiny prep school in Connecticut, then parlayed that into four more football years at a NESCAC school in New England. … Let’s just say that he feels some remorse watching a show like this, especially the part when the Southern belles painted their favorite player’s uniform number on their bodies before the first home game. I think he sobbed himself to sleep after the first show. Life just isn’t fair. You know where I stand on Bonds: Like most people, I want less of him in my life. That’s why I never watched the Bonds reality show. (As the ratings proved, I wasn’t alone.) And after plowing through “Game of Shadows,” a well-reported magazine feature disguised as a 300-page book, I certainly didn’t intend on subjecting myself to another Bonds hardcover. But back in June, I was going on a cross-country flight and needed something to read. Someone had sent me Pearlman’s “Love Me, Hate Me” in the mail a few days before, so I threw it in my bag with a couple others. We took off, I pulled out the book … and by the time we landed, I was done. It’s a riveting book for a couple of reasons: First, Pearlman interviewed more than 500 people for it, so there’s a wealth of information that I just hadn’t read before. Second, Bonds does make for a fascinating biography subject — more interesting than Babe Ruth and Roberto Clemente, actually … and, yes, I read both of those books, too — because he was the son of a famous athlete; he always has been something of a prodigy; his playoff travails in Pittsburgh were much more extensive than I remembered; and everyone seems to agree that he’s one of the biggest a-holes in sports history (and that’s before we even get to everything that happened from 1998 on). I realized during the book that I didn’t know that much about Bonds at all, and that he was infinitely worse than I realized. So that was eye-opening. And third, I thought Pearlman did a nice job writing this thing; he’s not Richard Ben Cramer or anything, but he keeps things moving and does a nice job letting the facts/quotes/stories/anecdotes hang Bonds while keeping a detached perspective. No small feat. Hey, you’re tired of Bonds. I know. Believe me, I am, too. But this was a good book. It’s worth reading.